How do I know what size group I need to hire? Keep in mind, your situation may vary. We are happy to advise you and may already be familiar with what size group works best in your chosen location. Another factor in your decision process depends on the type of group you are hiring. They may be acoustic only, or have amplification possibilities, in which case we would need to discuss electrical access and other details. Just ask….that’s what we’re here for! I am planning an outdoor event. What do I need to know about weather concerns? Outdoor events are beautiful and the majority of the weddings we play are outdoors. There are just a couple of thing to keep in mind when using musicians in the great outdoors. Many instruments are affected adversely by extremes in temperature and humidity. Between 60 and 80 degrees Fahrenheit we are quite flexible and may only need to consider shady locations if possible. Beyond 80 degrees, we will definitely need to be in shade or under a tent. (Direct sunlight can melt the varnish on some instruments, causing irreversible damage.) Under 60 degrees we are as accommodating as possible. Often heaters and creative placement of the group is all that’s needed. We’re happy to discuss your event, venue, and circumstances to work out viable options. In case of rain, there needs to be a rain appropriate alternative. What will the musicians wear at my event? For most events the women are in orchestral black (dressy and appropriate) and the men are in either tuxes, suits, or all black dress attire. We welcome your requests regarding the formality of the event. The musicians arrive 30 minutes prior to when they will begin to play. It takes only a few minutes to set up and this also gives them time to speak with a wedding director or event coordinator to check on any final details. Do musicians attend wedding rehearsals? The musicians are not needed at the rehearsal. 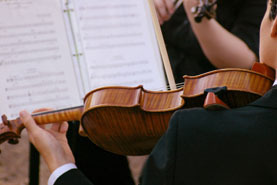 We work together to choose the music appropriate for your ceremony ahead of time. 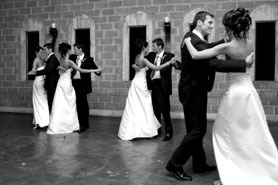 You are working with professionals with extensive wedding experience who are used to adjusting timing as needed. Our musicians take their cue from your timing….they accommodate and will end musical selections properly when everyone is in place. What does a standard wedding ceremony contract include? Yes! We try to accommodate as many requests as possible and are happy to discuss selections that are outside of our standard repertoire. We have quite a large selection in our library and work with you to make sure that they are able to be beautifully and appropriately played by the group you’ve chosen. There may be a music purchase required for items not already available in our library.If you have a request, please ask. In most cases the answer is yes. At present we accept check, cash, and money orders. Credit cards are an additional expense that we do not want to pass on to our customers. Can your groups accompany another musician at my event or wedding? Our groups often accompany singers at weddings and love playing with other musicians when possible and appropriate. We can work out a rehearsal with little or no cost to ensure everything goes smoothly the day of your event. What musicians do you use? We hire only fully qualified, professional musicians…..no amateurs or students. 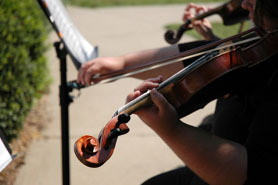 Most of our musicians have music degrees as well as extensive playing experience with professional organizations. Some of our musicians (ie: bluegrass, celtic and folk for example) may not have musical degrees but do have commensurate performance experience and a solid track record of working professionally in their fields. Do we need to choose the entire 30 minutes of prelude music for our wedding ceremony? For the prelude you may be involved in choosing all of it or you are welcome to leave it in our hands. What many couples choose to do is to provide us with a list of pieces they really enjoy and would like to be included in the mix of prelude music. And/or they may have some pieces that they prefer are not played. We honor those requests and fill in as needed. What wedding ceremony music do we need to select and how do we do that? We are here to help you every step of the way, providing resources to sounds clips and repertoire lists, consultations, and email support. This is your day and we want to make it match your vision. Have additional questions that were not answered here? Please contact us. We could not have been more pleased with the beautiful music for the ceremony! You all "nailed it"! Everyone commented on how reverent the ceremony was and, as we both know, music sets the tone. It has been such a pleasure to work with you and we could not be happier with the results!! Many thanks for all your attention to detail and putting together the wonderful music for Libby and Whit's wedding. It was an incredible evening and one we will never forget! Many, many thanks!! I have heard such glowing reports on the beautiful music!! Clair de Lune was absolutely glorious! Everything was wonderful. EVERYONE thought "it was the most beautiful music at a wedding they had ever heard." I just knew y'all would nail it!!! Thank you so, so much! It was an honor to have you coordinate and perform the music for us. You have no idea how many compliments we have received. It was beyond my highest expectations and dreams, I felt like I was sitting at the most incredible classical concert. The music was literally a dream. Also, working with you was one of the best parts of the wedding preparations. You were so wonderful, kind, and could read our minds when it came to music! I wish I was having another wedding just to get to plan something with you again.